The board voted unanimously as audience members shouted "Shame!" After a meeting punctuated by angry audience outbursts, the Arlington County Board voted up a multimillion-dollar incentives package for Amazon, which has announced plans to build its second headquarters in Crystal City, Virginia. The 5-0 vote on Saturday came after an extensive public comment period in which more than 100 people signed up to speak, including several community opponents to Amazon's arrival. The tense public meeting featured heated back-and-forths between board and community members. As board members announced their "yes" votes, people in the audience shouted "shame." Under the proposed package, Amazon could receive a direct payout estimated to be worth $23 million directly from the county and benefit from $458 million in transportation, housing and infrastructure spending over a 10-15 year period. The direct incentives will come from a hotel tax called the Transient Occupancy Tax. Arlington County expects to see more money flood in from that tax as business travelers come to the Amazon campus and would give Amazon up to 15 percent of revenue over 15 years. The county's taxpayers will pay for some of the infrastructure investments, and grants will cover more, under the proposal. Business leaders including the local Chamber of Commerce support the package, saying the economic benefits far outweigh the money spent to lure Amazon. Arlington County expects a $342 million revenue boost over 16 years, mostly from property taxes. The state of Virginia has already approved a $750 million incentives package for the company. 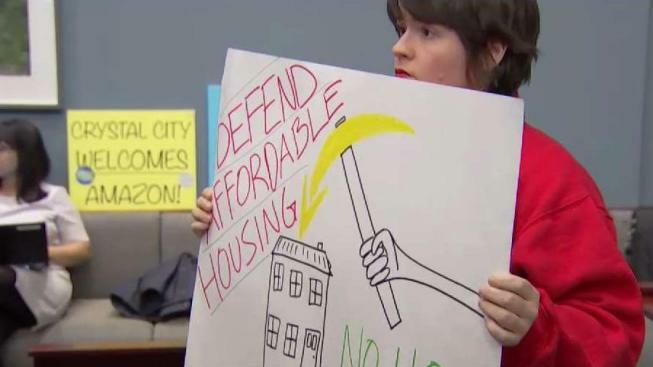 Opponents are concerned that Amazon’s second headquarters will cause housing prices to balloon, forcing out residents. A coalition of unions, progressive groups, racial justice advocates and environmentalists also take issue with the company’s anti-union moves and partnership with Immigration and Customs Enforcement (ICE), according to a letter signed by thirty organizations. Create up to 37,850 jobs to the county with an average wage of $150,000 a year plus benefits. County Manager Mark Schwartz recommended the board approve the plan and the five-member body is expected to follow that recommendation. The board meeting on Saturday featured heated commentary from community members, including some outbursts that interrupted the board's deliberations and led to at least two recesses. Some community members who spoke against the proposal said that board members did not understand the fear Amazon's arrival poses for low-income and immigrant communities. "This vote today is about racial justice," Danny Cendejas, a member of the La ColectiVA advocacy group, said. "We have been talking to folks in communities of color, immigrant communities. We have been hearing consistently the concerns about gentrification." Other speakers noted Amazon's relationship with ICE as a reason not to endorse the incentives. Board Chair Christian Dorsey acknowledged concerns with Amazon's relationship with ICE but said that frustrations with immigration policies should be directed to the federal government, not Amazon. Board members also praised the work by county officials who won the bid to bring Amazon to Northern Virginia. Board Vice Chair Libby Garvey said she is excited for the future of Arlington with Amazon. "Arlington has done a lot of changing in the 40 plus years I have been here and we are ready for this change," Garvey said. "We've planned for this growth, we've planned for these jobs, but we did not expect to get so much of this in one agreement." And County Board member Erik Gutshall said Amazon's arrival has helped to revitalize community-driven activism. "Arlington's story has long been rooted in excellent citizen-driven planning," Gutshall said. "Now it's this board's opportunity to define the future of our wonderful little county." Still, all board members acknowledged that the county must redouble its efforts to secure more affordable housing, investments in education and infrastructure and managed economic growth. "You don't deal with affordability by keeping people out. You deal with affordability by growing the supply," Dorsey said. "The work now truly begins." After heated opposition from residents and lawmakers, Amazon dropped a plan to open another massive campus in New York City. So far, the company has found Virginia more welcoming.